Ganesh Chaturthi is another popular festival in India and is celebrated as birth day of Lord Ganesha where each and every devotee celebrates this beautiful Festival in his own way. Lord Ganesha is known as son of Lord Shiva and Devi Parvati. Lord Ganesha is well known as god of good luck and fortune, Lord Ganesha always worshiped with goddess Laxmi. Lord Ganesha is also known as Elephant Headed and rat is considered as his vehicle. Unlike Diwali, Ganesh Chaturthi is celebrated in the month of August or September, all over India but it has different passion and importance in the states of Maharashtra, Karnataka, Andhra Pradesh and Goa. The festival begins with the installation of huge Murti of Ganesha in homes and at different places also known as Pandals, which is especially constructed and beautifully decorated only for this beautiful occasion. Various artists put their effort day and night in making the Murties. 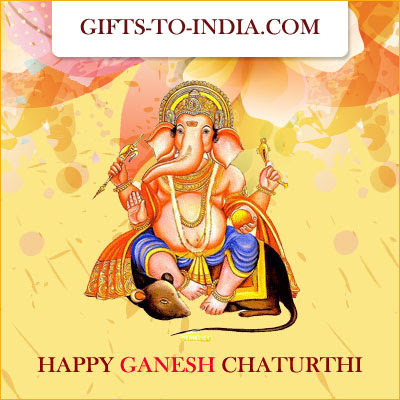 Ganesh Chaturthi is celebrated to honour of Lord Ganesha's birthday. To celebrate Ganesh Chaturthi, a Murti of Shri Ganesh is worshipped. For the same, a looking-live model of Lord Ganesha, ranging in size from inches to quarter a hundred feet, is formed out of clay, usually One to Three months prior to the occurrence of the festival. The murties are usually too lively to rejuvenate any peace-seeking soul. Right on the day, when the festival has to be celebrated, this murti is worshiped after being raised on stages and stands to heights so to let the murties of Lord Ganesha be exposed to larger distances. This is done for the people consider this to be auspicious in the sense that the Lord Ganesha, on the occasion of Ganesh Chaturthi, can bless masses. 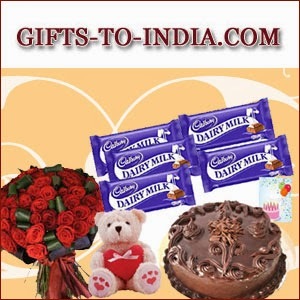 On this special festival, Hindus also prefer to gift their relatives and friends with special gifts. This normally shows their love and devotional attention. They also want to praise the Lord Ganesh in this manner. 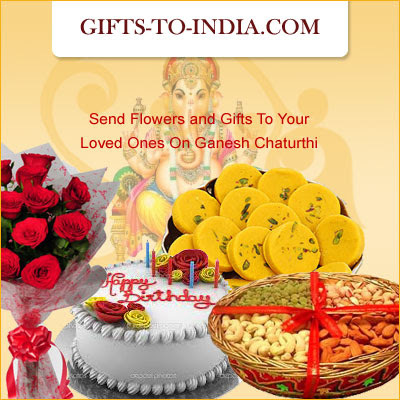 Send Flowers and Gifts to your dear ones on Ganesh Chaturthi through online and spreads happiness and brightness in the lives of them. Gifts are very important when such occasions are concerned. This is the reason why people must have an idea about the traditional Gifts that they can gift on such occasions. The traditional Gifts are those which have the god himself in one form or the other. This is usually given so as to bring good luck and prosperity in the life of the people to whom you are giving this ift. The large population across the vast region of India is consists of different religions that celebrate their own religious festivals. Hinduism, Islam, Christianity and Sikhism are major religions in India, among others. Some festivals are unique to local regions while there are other vibrant festivals celebrated throughout the country. Teacher’s Day is a very special occasion for everyone especially for the teachers and students. It is celebrated by the students every year on 5th of September to honor their teachers. 5th of September has been declared as the Teachers day in India. Our earlier President, Dr. Sarvapalli Radhakrishnan was born on 5th of September so Teacher’s Day in India is being celebrated on his birthday because of his love and affection towards teaching profession. He was a great believer of education and highly famous as the scholar, diplomat, teacher and President of India. Teacher’s Day is a great occasion for celebrating and enjoying the relationship between teachers and students. Now a day, it is celebrated with the big enthusiasm and joy in the schools, colleges, universities and other educational institutions by both students and teachers. Teachers are given lots of wishes about long life from their students. In the modern time the celebration strategy of the teacher’s day has been standard. Students become so happy at this day and plan for the way of wishing their favorite teachers. We should realize the necessity and value of our teachers in our lives and celebrate Teacher’s Day every year to pay them homage for great job. Teachers are more than our parents who mold our mind towards success. They become happy and get their success in life only if their dedicated students go ahead and spread teachers name all over the world through his activities. We should follow all good lessons in our life taught by our teachers. Teachers are like real potters who not only give our life a shape, but also enable to light like a lamp forever after dispelling the darkness from all across the world. So that, our nation can be enlighten with lots of bright lamps. Therefore, the nation pays homage and respect to all the teachers in the country. We can nothing give our teachers in return to their great job however; we should respect them always and say thanks. We should take a pledge to heartily respect and honor our teachers in our daily lives as without a good teacher we all are incomplete in this world. 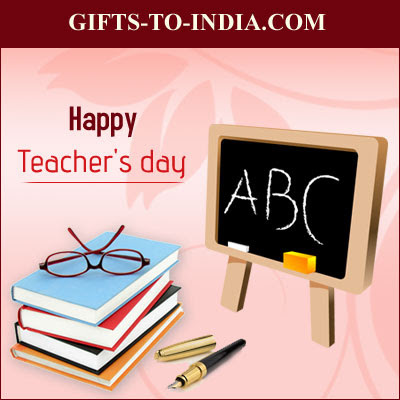 Send Teacher’s Day Gifts to India to make your dear Teacher feel your presence. 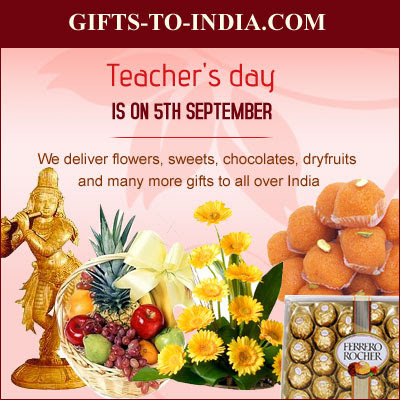 You can also send Teacher’s Day Flowers to India and show your class of choice. A good teacher has greater influence in shaping the life of an individual even more than his/her parents. In our country’s culture, a teacher has been given a place above the almighty god. Teacher's Day is intended to be special day for the appreciation of teachers. It is a worldwide occasion but in India, it is celebrated on 5th September. 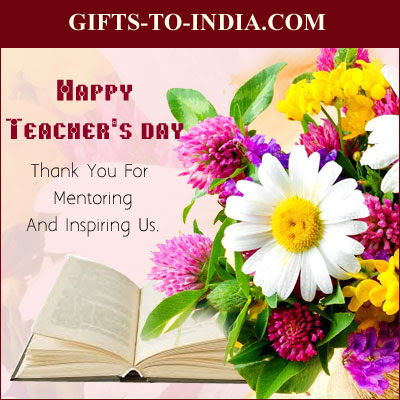 Online gifts shops offer you delectable Gifts and flowers to thank your teachers for their contributing their great portion to enhance your life.